It’s been my experience that most churches are way off base in their leadership structures. In light of what the New Testament says about leadership in the churches this is difficult to comprehend. Nevertheless Phil Newton has done a great service to the 21st Century church by providing an introductory guide to developing a biblical infrastructure for churches that take being biblically based and effective seriously. 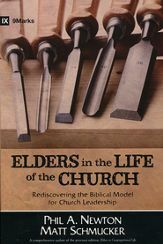 Part One is composed of answering the question: Why Churches Should have Elders. In Part Two Newton exposits three key texts on how Elders functioned in the New Testament: Acts 20:17-31; Hebrews 13:17-19; and 1 Peter 5:1-15. In giving a thorough exposition of each passage he demonstrates how Elders are models for their congregations; how Elders and the congregation work together in harmony; and how their primary calling is to be spiritual leaders for the good of the congregation and God’s greater glory. In my opinion the most helpful section of the book is in part three. In this section Newton shows how a leadership team can transition into a fully functioning Elder Leadership in the Church with Deacons as well. All four examples are of large Baptist churches going from a Diaconate Board to two separate functioning boards of Elders and another of Deacons. Giving a step-by-step process Newton shares from personal experience [South Woods Baptist Church] and from the experience of other well-known ministries (Mark Dever’s [Capital Hill Baptist Church in Washington D.C.], Jeff Noblit [First Baptist Church of Muscle Shoals, Alabama], and John Piper’s [Bethlehem Baptist Church in Minneapolis, MN.] transitions from Deacon Board structures to adding Elders into the mix). The process is slow, methodical, and takes into consideration traditions, a thorough study of biblical passages on leadership, and how the principles are studied and bandied about in teams. The process for the four cases studied is very helpful to keep in mind no matter what background your church has, and where it’s at in the transitional process. I think this is an excellent book for leadership teams to study and for pastors, staffs, deacons, and elders to use in seeking to become as biblically effective as possible in seeking to develop a healthy infrastructure for the good of the Church and the glory of God. What I especially like about Newton’s book in particular is that he doesn’t impose any particular church government upon a church, but allows the Bible to speak for itself. He encourages a thorough study of the biblical evidence in arriving at one’s model of church government. I highly recommend this book as an extremely helpful guide in leading one toward a more biblical model of church government.